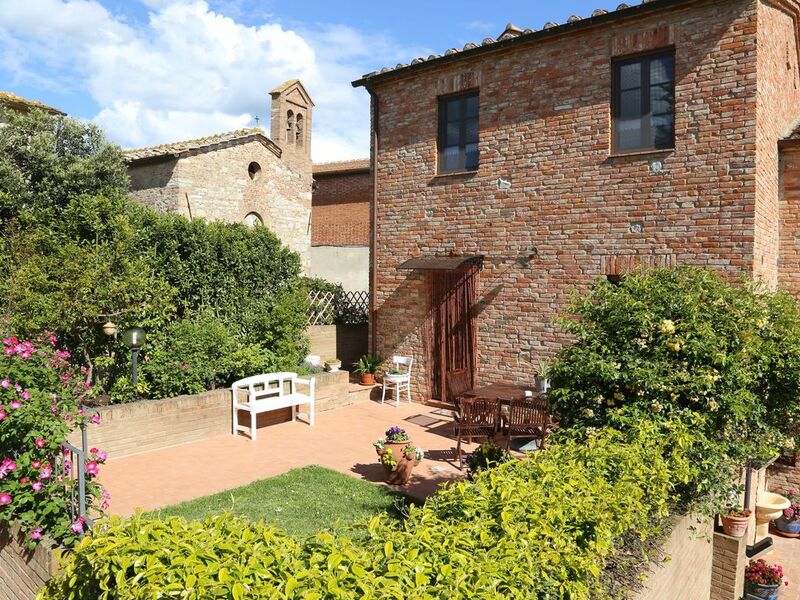 The apartment is situated in a typical corner of the Tuscan country, less than 15 km from Siena. It consists of two floors with private entrance, private garden and swimming pool. The flat (around 75 square metres), recently rebuild in the Tuscan style, is furnished with very good taste and provided with modern conveniences (mosquito net at the windows, cable television). On the ground floor there is the living room with the fire-place and the open-plan kitchen; upstairs there are the bath, with shower, the double room, the single room and a charming mezzanine (with window) with a three-quarter bed. A lovely apartment in Tuscanny, far enough away from everything to give a sense of the countryside but close enough to all the things of interest. The hosts are charming and helpful and the apartment is well equipped, the local restaurants are fantastic and the scenery is breathtaking.My wife and I enjoyed our stay and we highly recommend Asciano for a get away from it all vacation. Stunning views and well thought out house. We loved staying in this apartment which is more like a small house. It had everything we needed in the house and was a good space to live in. The views were amazing and we loved the peace and quiet. The pool was a good size and looked out over the hills. Lovely apartment with stunning views! Had a great stay at Emiliano and Irka’s wonderful holiday apartment. It was super clean and well equipped. The beds were very comfortable and the neighbours were quiet. If you need to use the double bed on the top floor be warned the ceiling is very low - I banged my head twice going up the stairs and after that I remembered - maybe they can write ‘mind your head’ below the top step to remind people to duck :)?! The apartment is very well placed for visits to Cortona, Siena and Florence though a car is essential as it is for any stays in Tuscan countryside! Some lovely local restaurants nearby and I highly recommend the Ricasoli vineyard for tours and tasting! Thanks, I hope I can return again in future! Thank you very much ! We have a great experience too with you and your family! We hope you return to visit you as soon as possible! Unforgettable days in "Crete Senesi"
We were happy to spend six days in this beautiful area. The listing description was accurate in every aspect. The property was clean and well-maintained. Our host (who speaks good English) and his wife were really attentive and helpful people, and they provided excellent customer service. We were given home-made marmelade. Coffee, tea and cocoa powder were prepared with milk, toast and different cookies, fruit... We could even pick fresh tomatoes and herbs in the small garden. The swimming pool was also refreshing every day! We would definitely recommend (and we already have recommended) this property to our friends and relatives. During our stay we visited Siena, San Gimignano, Sovana, Pitigliano. Thank you very much! We would be happy to meet you again! Very nice family! We had a very pleasant and relaxing holiday during 2 weeks, in that small and peaceful village of Mucigliani. The village is situated on top of a hill, in the midst of a most wonderful undulating landscape.. There are paths leaving from the village in every direction, ideal to go for a walk to go enjoy the landscape ...From the terrace in front of the house, we had a splendid view on the landscape... the small garden had a bench and 2 rather small chairs .. In the small but comfortable house (suited for rather 4 than for 5 people) we found everything we needed: well equiped kitchen, good beds with fresh linnen, good furniture... the 3/4 bed on the top floor is situated under a low roof, so this was not suited for adults... the swimming pool near the house was built very recently, had clean water, and was well maintained, also we did not have to share it with a lot of people... the village is 10km from the nearest shop (COOP in Taverne d'Arbia), where we found everything we needed for food and drinks. The owners were very friendly and hospitable, english was no problem. They welcomed us with wine, drinks, fruit and fresh herbs, and there were fresh flowers .. the weather was variable, and during a week we had to endure a strong wind, but this did not hold us from sitting outside in the evenings .. we apparently lived outside most of the time, we only had to shelter inside during some rainshowers .. on one day, rain kept coming down, so we had to take the car to go for a visit in Pienza and Montepulciano, 2 most attractive and beautiful towns... Siena, that beautiful Tuscan town, is only a half an hour drive, and we visited it in good weather .. this holiday was for us ideal, as we found peacefulness and simplicity, away from the clock and the pressure of daily life ! Le calme, une vue sublime et des couchers de soleil à couper le souffle sont l'écrin de cette maison idéalement située pour visiter la campagne toscane. Irena et Emiliano nous ont accueilli chaleureusement et ont toujours été disponibles pour des conseils de visite ou en cas de besoin. From NORTH (Milan): Exit Motorway A1 (Milan-Rome) Firenze Certosa, Superhighway Firenze-Siena. Continue towards Arezzo, take the exit for Taverne D' Arbia. Follow directions for Asciano (sr 438). After ten minutes' drive, turn left for MUCIGLIANI and take the dirt road until arriving to the second construction on the left. From SOUTH (Rome): Exit Motorway A1 (Rome-Milan) Valdichiana, follow directions for Siena, take the exit for Taverne d' Arbia and follow directions for Asciano (sr 438). After ten minutes' drive, turn left for MUCIGLIANI and take the dirt road until arriving to the second construction on the left. You can find peace and relax in the nearby SPA of Rapolano, Chianciano and Bagno Vignoni. This is the ideal location to visit the most beautiful cities of artistic interest in Tuscany: Firenze, San Gimignano, Pisa, Volterra, Arezzo and the Val d’ Orcia, with Montalcino, Pienza and Montepulciano. In an hour’s drive you can reach the fascinating “Maremma” coast and the beaches of Castiglione della Pescaia and Punta Ala. The country of Siena is very famous for “DOCG” wines, as Chianti, Brunello of Montalcino, Nobile of Montepulciano and Vernaccia of San Gimognano. An for those who love shopping there are the nearby VALDICHIANA OUTLET VILLAGE (20 minutes’ drive) and the exclusive THE MALL in Incisa Val d’ Arno (an hour’s drive).